Technology to produce an alternative fuel for supplementing or replacing Natural Gas deliveries. LPG/air mixing system produces homogenous mixture, which is 100% interchangeable with Natural Gas. Mixing systems offer an integrated gas energy solution for the mid-sized to large Natural Gas consumers. Technology can be used as back-up equipment or gas costs peak shaving. Technology is also an alternative solution. Economic reasons (back-up system) – uninterruptible gas service rates, better position to negotiate fuel cost with Natural Gas supplier. Alternative solution – pipelines maintenance and servicing, global cut-off of gas (emergency back-up), standby solution for accidents at pipelines. Supply a remote community with Natural Gas – permanent or temporary until extension of Natural Gas main. Combustion characteristics of LPG/air are identical to Natural Gas. No modifications of Natural Gas equipment: no burner modifications, no orifice changes, no regulator or line adjustments. You can switch to LPG/air immediately – no pre-purging or post purging of the line. When LPG is mixed with Air to the correct ratio, the resulting mixture will burn with the same characteristics as Natural Gas. Well-established in the world and proven system of Algas-SDI is controlled LPG-air mixing system with combination of mixing and vaporizing technologies. 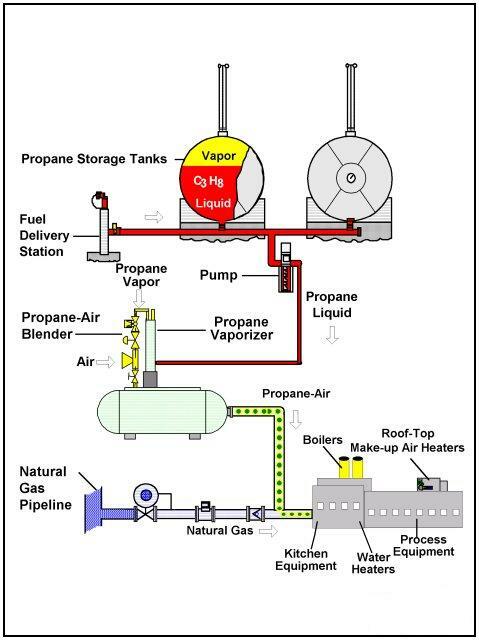 Depending on its type the vaporizer uses electrical or gas energy for transformation of LPG liquid to vapor. Blender of type diffuser uses pressure of the gas for drawing desired air quantity into the system. This is a simple and reliable system. LPG liquid is withdrawn from the storage tank and, if required, the pressure and capacity are raised via pump. Liquid is then heated in the vaporizer and converted to a vapor. Vaporized LPG is diluted with air in the blender depending on the LPG composition to produce a „LPG-air“ mixture. Homogenous mixture is then distributed via the existing Natural Gas piping without changes on individual burners.